LORD MOUNTARARAT: I don’t want to say a word against brains; I’ve a great respect for brains. I often wish I had some myself, but with a House of Peers composed exclusively of people of intellect, what’s to become of the House of Commons? LEILA: I never thought of that! LORD MOUNT: This comes of women interfering in politics. Lamplighters Music Theatre is, of course, the local specialist in this repertoire. In addition to the experienced crew of Savoyards, Lamplighters is constantly pulling in young singers and actors from the S.F. Conservatory and elsewhere, so that the company is renewed. 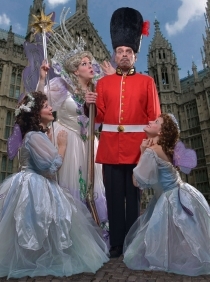 Iolanthe promises to be a bit of smiling, summer fun that won’t remind you of actual politics.